In February 1988, South Korean Pres-ident Rho Tae Woo announced in his inaugural address the foreign policy doctrine of “Nordpolitik” as Korea was responding to the close of the Cold War era. Nordpolitik accordingly manifested Korea’s will to normalize diplomatic relations with Communist states - the Soviet Union, China, and the Eastern European bloc - and, therefore, isolate Communist North Korea. Thus, in September 1990, South Korea and the Soviet Union established diplomatic ties. This was a tremendous shock to the North, a traditional ally of the Soviets. The Soviet president, Mikhail Gorbachev, was conscious of North Korea’s reaction and, in consideration of this, the South Korea-Soviet Union summit in April 1991 was held on Jeju, an international resort island, rather than Seoul, the capital and political center. The meeting of Rho and Gorbachev was a milestone in the ending of the Cold War, and Jeju Islanders launched a campaign to have the island designated an “Island of Peace” for global and common prosperity. Jeju’s geographic location at the heart of Northeast Asia, and its status as a natural wonder, befitted this status. To realize the vision, prestigious diplo-matic events were held back-to-back. 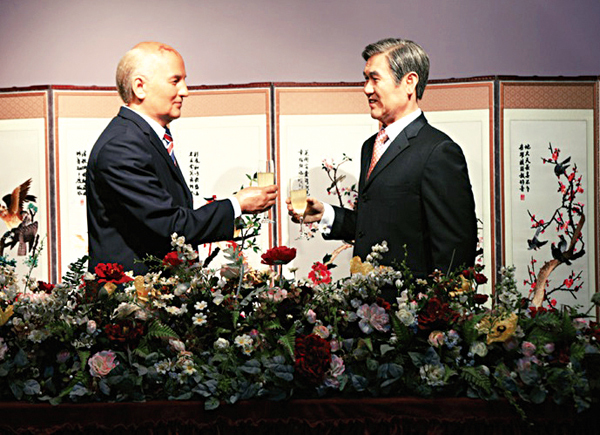 In April 1996, a summit was held between South Korean President Kim Young Sam and US President Bill Clinton. This was followed in June of the same year by a meeting between Kim and Japanese Prime Minister Hashimoto Ryutaro. There was even a banquet hall piano performance in 1995 by Chinese President Jiang Zemin, who had helped establish diplomatic relations between Korea and China in August 1992. The Korean government eventually declared Jeju an “Island of World Peace” on Jan. 27, 2005. The declaration wasn’t based solely on Jeju developing as a mecca for summit diplomacy and tourism, frequented by world leaders. The government also considered Jeju Islanders’ will for reconciliation and human rights in light of the tragic “April 3rd Uprising,” a tragedy in the period 1947-54 in which tens of thousands of civilians died amid the ideological confusion of the post-liberation era. The “Island of World Peace” designa-tion is also based on Jeju Islanders’ folk traditions of self-reliance and pride, symbolized by the “three absences” — no beggars, no thieves, and no gates. The “three absences” embody cultural traditions for an upright, self-sufficient and peaceful community life, in spite of the adverse conditions of rocky unproductive soils and rough seas. Besides Jeju, there are some famous peace cities in the world: Hiroshima (Japan), hit by nuclear weapons, embraces the ideals of anti-war peace and denuclearization, while Osnabrück (Germany), in consideration of the Treaty of Westphalia and the Holocaust memorial, propagates a culture of fraternity and tolerance. The two were declared peace cities by their local, self-governing councils. In contrast, Jeju was designated and signed into law as an “Island of World Peace” by the central government. 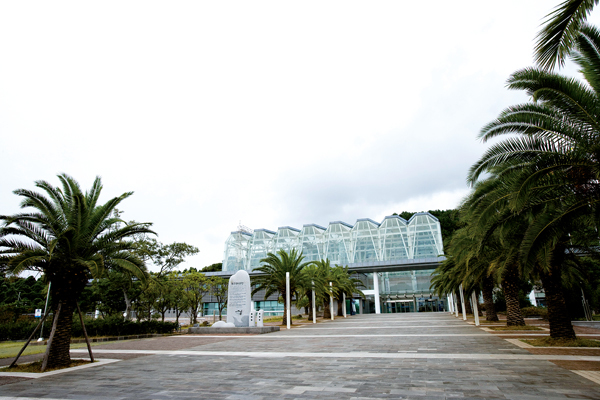 The Jeju International Peace Center, officially opened in September 2006, has become a site of peace education and exhibits wax figures of world leaders who have visited Jeju. Also, Jeju International Training Center (JITC) is affiliated with the United Nations Institute for Training and Research (UNITAR) and opened in October 2010. It provides various pro-grams on the environment and human security to public officials of the Asia-Pacific region. Furthermore, in remembrance of the April 3rd Uprising, Jeju April 3rd Peace Foundation was established in 2008, and the April 3rd Peace Park will soon be completed. Furthermore, the Korean government decided to designate April 3rd as a national memorial day this year, suggesting true reconciliation nears. In international projects, since 2007 Jeju Special Self-Governing Province has implemented a variety of Official Development Assistance programs, including building schools and libraries, donating medical devices, and improving accommodation in Mongolia, the Philippines, East Timor, Cambodia, Vietnam and India. Having almost finished 17 existing peace projects, the province is now preparing additional projects for world peace. This is all happening within the context of continued territorial and historical conflict across the East Asian region which has heightened tensions. Song Min-Soon, former Korean foreign minister, recently wrote in a major daily urging the heads of the Korean, U.S., Chinese, and Japanese delegations to have the Four-Party talks on Jeju, the “Island of World Peace,” to increase cooperation and harmony across the western Pacific. The “Island of World Peace,” which has pursued East Asian peace through the Korea-China-Japan summit in 2009 and the Korea-ASEAN special summit in 2010, continues to spread the spirit of peace.